We’d love your help. 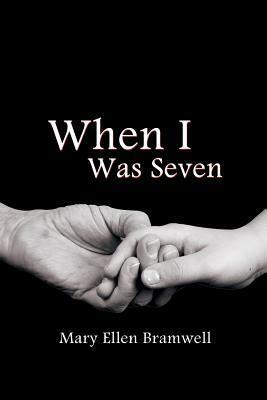 Let us know what’s wrong with this preview of When I Was Seven by Mary Ellen Bramwell. To ask other readers questions about When I Was Seven, please sign up. A lovely story dealing with family and life issues, told by a charming and authentic 7 year old. Kudos, very well done. An author takes a big risk when attempting to tell a story through the eyes of a young child, especially when the book is aimed at an adult audience to explore complex, mature issues. There are so many things that could go wrong. The language and knowledge/experience base of the narrator could come off as too grown up. The story itself could be dumbed-down and appear more of a children’s book rather than one geared towards adults. The story could be overly insipid. The relationship between the c An author takes a big risk when attempting to tell a story through the eyes of a young child, especially when the book is aimed at an adult audience to explore complex, mature issues. There are so many things that could go wrong. The language and knowledge/experience base of the narrator could come off as too grown up. The story itself could be dumbed-down and appear more of a children’s book rather than one geared towards adults. The story could be overly insipid. The relationship between the child and the adult figures in his life could be portrayed as equals rather than as a more natural superior-subordinate interaction you have between a parent and a child. So it was with this sense of possible foreboding that I started to read Mary Ellen Bramwell’s When I Was Seven. I had read one of Ms. Bramwell’s previous works, Apple of My Eye, which I thought was an excellent novel, so I knew this book would be well-written, but could she pull off writing in a seven-year old’s voice? The answer is a resounding YES. You actually believe you are viewing the world through the eyes of an intelligent and curious young boy as he faces life’s tragedy and challenges. It is a story of perseverance, redemption, friendship, responsibility and, most importantly, love. It is a book that I wholeheartedly recommend. Because When I Was Seven is so different from Apple of My Eye, Mary Ellen Bramwell shows herself to be a versatile author and I look forward to see what she tackles in her next book. My only quibble with the book is that I thought the title, while fully descriptive, may do Ms. Bramwell a disservice and may deter some potential readers as they may anticipate the problems I outline above. To them I say: read this book. You will be moved to laughter and to tears and a lot of emotions in between. I believe this book will especially resonate for anybody who grew up close to one or more of their grandparents. When I Was Seven is a novel by Mary Bramwell. This novel is absolutely fantastic. It deals with death and dying, misplaced anger, kidnapping, and love. It is very well-written and the characters are extremely realistic. Mary Bramwell has an amazing way of writing about death and dying that keeps you glued to the pages until you are finished. You definitely need a box of Kleenex while you read this book. How can you expect a young boy of seven to accept death? Lucas is seven when his Grandma come When I Was Seven is a novel by Mary Bramwell. This novel is absolutely fantastic. It deals with death and dying, misplaced anger, kidnapping, and love. It is very well-written and the characters are extremely realistic. Mary Bramwell has an amazing way of writing about death and dying that keeps you glued to the pages until you are finished. You definitely need a box of Kleenex while you read this book. How can you expect a young boy of seven to accept death? Lucas is seven when his Grandma comes to stay at his house. At first, he thinks she is staying until she gets better after being in the hospital. However, she is here because she is dying of cancer. Lucas has a special connection with his Grandma and has spent hours playing and talking with her. He continues this while she is at his house. She explains to him that she is dying and how to accept her death when it comes. She explains how the medicines she takes for pain confuses her and sometimes she doesn’t speak because there is too much going on in her head and she is waiting until it settles. He spends hours with her sometimes just watching her sleep. He feels it is his job to watch over her. Meanwhile things are not going well between his parents and he has no idea what is going on there. They are arguing more and more and Dad is working such long hours. Mother is not accepting her Mother’s death and that is causing some tension. Then Grandma tells Lucas she had a sister who had left her long ago and she wanted to see Abby before she died. Since Grandma had never mentioned this before and all Mother knew was that Grandma had been an only child, Mother doesn’t believe her. She thinks that Grandma is thinking of her older daughter Abby who had died before Mother was born. Lucas believes Grandma and enlists an unlikely ally to help him. He asks his paternal grandmother to help him. She and her son and daughter-in-law had been estranged for years so when Lucas asked to visit his other Grandma, his parents reluctantly agreed. When they meet, she asks Lucas to call her Mamie. She agrees to help him. Can they find Abby before it is too late? Is Mamie helping Lucas to get “back at” her son and daughter-in-law or to hurt them or Lucas? Can a person really change? Is this too much pressure for a seven year old boy? When I Was Seven by Mary Bramwell carries a poignant power. The reader finds himself caring deeply about seven-year-old narrator Lucas who embodies a rare combination of innocence and prescience. His compassion for his dying grandmother Josephine is marked by a seemingly bottomless desire to understand. As he is presented with the seemingly quixotic challenge of discovering his grandmother’s long lost past, Lucas must confront deep stresses on his parents’ marriage, the steady deterioration of Josephine, and a markedly compromised second grandmother whom he enlists in this quest. That second grandmother, Mamie, serves as a wonderful counterpoint to the more earnest grieving family members. In her interactions with Lucas, Mamie is thorny, witty, and frank. She shares a tendency with Josephine to treat Lucas with a candor that his parents refuse to in their efforts to shield him from further pain. The reader watches Lucas grow throughout the novel as he gains wisdom not only beyond his years, but often beyond the adults in his life (“I kept listening like Grandma told me to, but I was listening to silence. I guess that’s important too”). The presence of his friend Justin grounds Lucas in the normal schemes of little boys, like their building of a doghouse as a way to convince Justin’s parents to get a puppy. In other words, despite Lucas’s extraordinary qualities, Bramwell has created such a vivid, plausible world that the reader embraces his interactions as sharply realistic and therefore more affecting. The slow unfolding of grandma Josephine’s past – through her halting recollections, Lucas’s persistent questioning, and Mamie’s investigations – keeps the reader engrossed as do the domestic dramas bubbling to surface and the mysterious evocations of distant beach memories. And then there are the nifty plot twists, which shall not be revealed here. When I Was Seven reverberates with echoes of the past and shimmers with possibilities for the future. Bramwell has created the compelling tale of the loss of a grandmother that is wonderfully life-affirming. Great story with a touch of mystery! I really enjoyed this book! The story of Lucas as he struggles with the death of his grandmother and trying to help her solve one last mystery before she goes. Lots of laughter and definitely lots of tear, but worth every single one! I started reading and never stopped it kept me til the end,it is a good story about how much a seven year old can do when they have to. Reality put into beautiful words. Well written and a lot of intrigue encompassing the whole family, grandparents neighbours as well as pets. High!y recommended for all adults. When I chose this book, I didn't know what to expect. This was a powerful story of love and listening and faith. Very highly recommended. I had tears in my eyes at the end of this story. Beautifully told through the eyes of a seven year old child who was wise beyond his years. A young boy and his love for his grandmother. A good story about a seven year old boy and his terminally ill Grandmother. An interesting book - not action packed - plain family dynamics, love and loss. Sometimes it takes a child to find the truth. Hope that you enjoy this book as much as I did. 5 Stars, because I like to be drawn into the book.